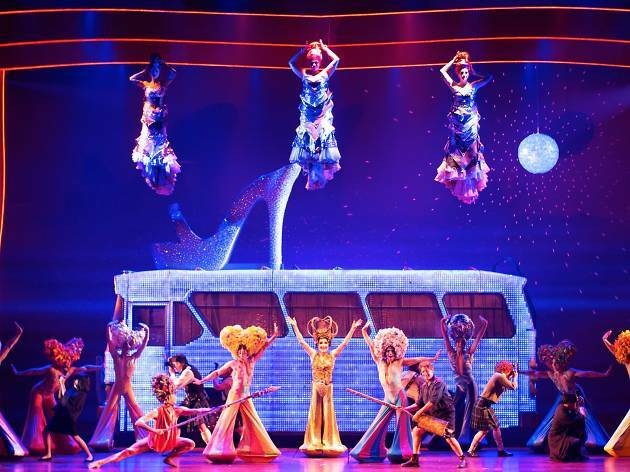 Priscilla, Queen of the Desert is the crowning achievement of Australian commercial musical theatre. When the stage version of Stephan Elliott’s 1994 film premiered back in 2006 it was expected to have broad appeal, but few would have anticipated its ongoing success. 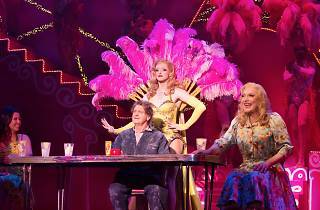 Eleven years later, the musical has played every major theatre market around the world, including Broadway and the West End, and continues to tour. This return Australian tour is a victory lap of sorts for this beloved show, capturing all of the joy of that premiere production. 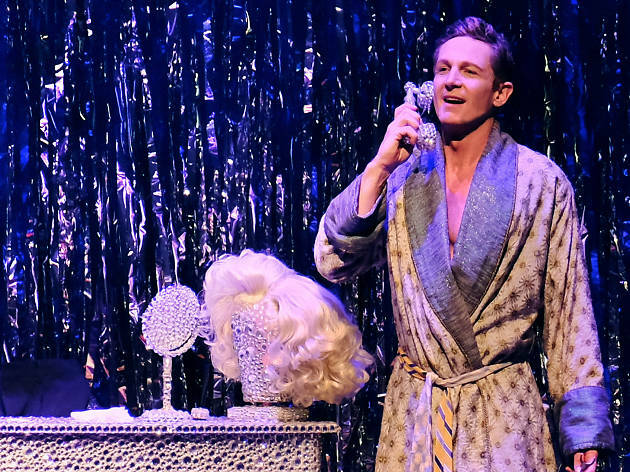 A few changes have been made to the song list – ‘It’s Raining Men’ takes the place of former opening number ‘Downtown’ – and the show is a little slicker in its storytelling and execution. If there’s any criticism to be made it’s that the show is maybe now a little too slick for this sprawling and unruly story. Whether you’ve seen the film or not – and if not, what have you even been doing for the last two decades? 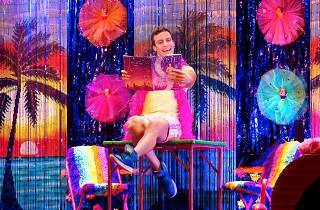 – the stage version stands on its own two feet as a funny and surprisingly touching jukebox musical, packed with camp disco classics. 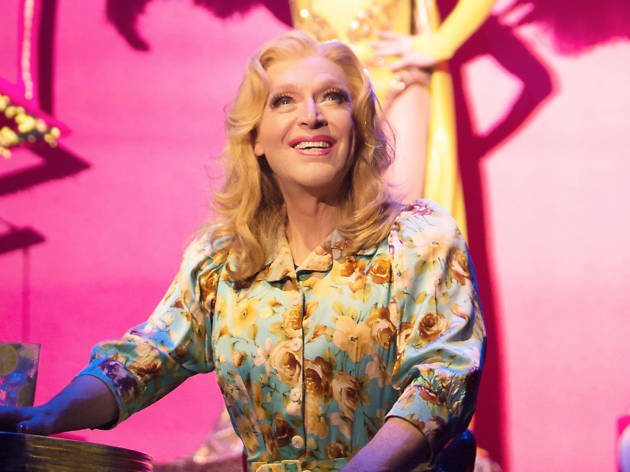 The plot follows that of the film closely: Sydney drag queens, Tick (David Harris) and Felicia (Euan Doidge), and an older transgender performer, Bernadette (Tony Sheldon), travel in a ramshackle bus to Alice Springs, where they’ve been booked for a show. It’s a typical fish-out-of-water tale as the trio encounter the outback and its inhabitants. But it goes deeper than that – Tick is secretly travelling to meet his son for the first time and is worried he’ll be rejected when his boy learns of his life in drag. The creative team has clearly put a lot of love into getting the bus back on the road. Elements of Brian Thomson’s set – magically conjuring up vast expanses of the outback inside the four walls of a theatre – have been adjusted or slightly scaled down to make the show easier to tour. But it still looks a million bucks thanks to Oscar winners Tim Chappel and Lizzy Gardiner’s seemingly endless parade of sequins, feathers and fabulously repurposed household objects. 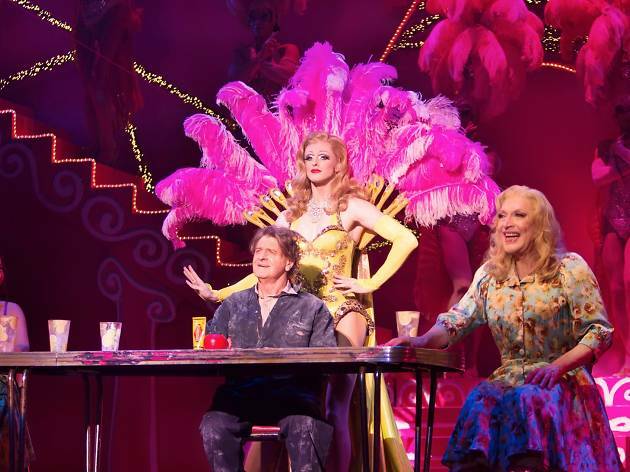 In an age of the glossy, beautiful drag popularised on RuPaul’s Drag Race, Priscilla still stands apart with its homemade spectacle. 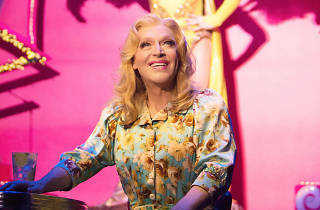 Tony Sheldon, who originated the role of Bernadette in 2006 and has played the character all around the world (he was nominated for a Tony Award on Broadway), is the sophisticated, glamorous soul of this production. He’s always imbued the character with more warmth than Terence Stamp’s frostier portrayal in the film – some adjustments have to be made to make these characters translate to a 2,000-seat theatre without the benefit of close-up – but there’s perhaps even more tenderness this time around. Bernadette forms a lovely found family with her two fellow travellers, and her newfound affection for Bob the mechanic (Robert Grubb) is moving. 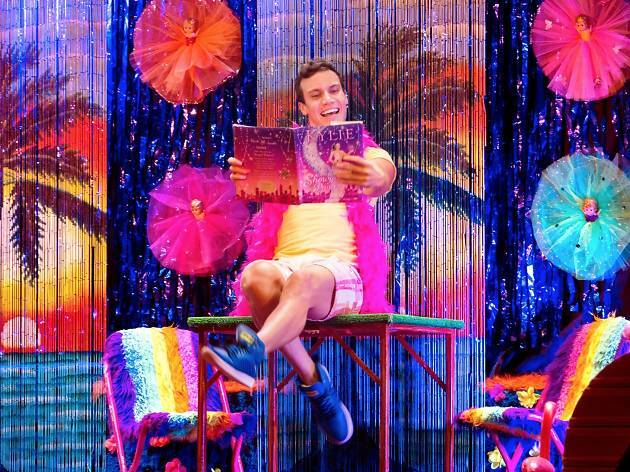 Sheldon can still make one particularly romantic scene – featuring a verse of ‘MacArthur Park’ – feel like a fresh discovery of love, even after 1,700 performances. The song best expresses the spirit of the show: a pop-disco hit gives voice to a character as they reach a pivotal moment in their life. Then suddenly a line of dancing cupcakes – with sweet green icing flowing down – appear onstage for a very silly and extended visual gag. The late Ross Coleman’s sweetly camp choreography – augmented by Andrew Hallsworth for the new tour – works gorgeously with what are often cumbersome costumes for dance. 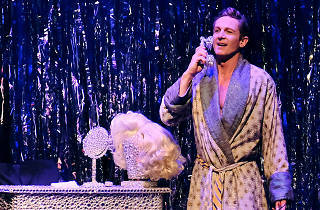 Leading the cupcake chorus line is David Harris, perfectly cast as Tick. He sings beautifully and, like Sheldon, manages to find a consistent emotional arc within director Simon Phillips’ fast-moving production. Euan Doidge sings and dances well and finds the sassy side of Felicia, but could ease up a little on the constant boyish energy. 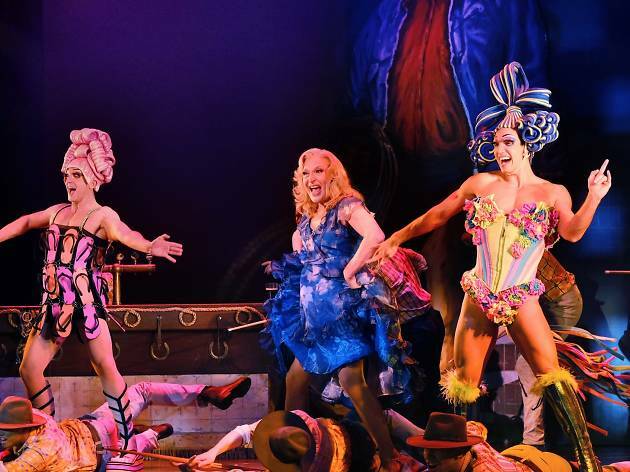 And the three divas (Angelique Cassimatis, Samm Hagen and Cle Morgan) who float down from the rafters every few minutes provide the voice of the outback and every party in every town, belting out pop hit after hit. If the show were being made now there are some things you might adjust in the interests of political correctness and inclusivity: although Bernadette is a wonderful trans character some of the jokes at her expense are a little on the nose, and you’d ideally have a trans actor playing this role. And Bob’s Thai bride Cynthia (Lena Cruz), who performs a wild ping-pong ball routine, is built from stereotype; thankfully Cruz’s performance is so winning and commanding you can’t help but laugh. These things are fairly easily forgiven – they’re part of a show that absolutely has its diamante-encrusted heart in the right place and is ultimately all about the families we are born into and the families we create for ourselves. 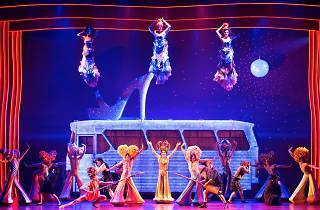 Check out our guide to the best musicals now and upcoming on Melbourne stages.